On December 17, the 40th day after Super Typhoon Haiyan, the world has moved on. In the U.S., we debate the race of Santa Claus. News of the broken remains in Tacloban and the Central Philippines, where Filipino Catholics are taking note. Forty is a biblical milestone–for cleansing rains, for visits to the mountaintop, for lengths of mourning time. About 100 gathered to sprinkle holy water on the ruins and mourn the more than 6,000 who were killed by the typhoon. Five thousand were from Tacloban alone. There are still 1,779 missing. After the powerful surge of water changed their lives, a sprinkle of holy water is the signal that it’s time to move on. 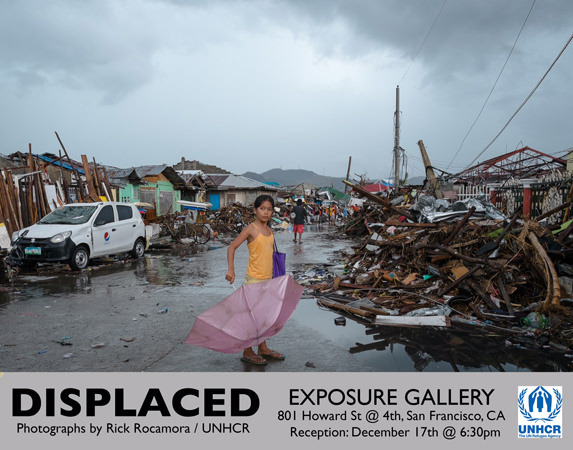 My friend, award-winning photographer Rick Rocamora, has moved on too. He’s back in the Bay Area, but was in the Philippines when the typhoon hit. It was either lucky or unlucky, I suppose, for him to be our “official” eyes. He got the assignment to document the tragedy for the U.N. for the first 20 days. His images are on display in San Francisco through mid-January. You can hear him talk about his experience here. He typically took photos of Filipino people. When his camera came out, they smiled, and put on a happy face. It was only when Rocamora spent more time with them that he was able to put their situation in context. The humanity in the rubble. Forty days after, more outsiders are slowly getting access to Tacloban. There’s still no electricity. Food and water are still hard to come by, but the roads have opened up a little more. And individuals are going there, like one of my relatives, Judy, the wife of my late cousin. Relatives tried to talk her out of going, insisting that it was better to give money to reputable organizations, like my favorite, Catholic Relief Services, known for its efficiency in distributing resources. But she insisted on going. “It was like a calling,” she told me before she left. When she got there, she was safe, but there were still robberies and looting. Judy went on her own, bypassing the significant amount of red tape there, and connected with the Philippine Red Cross. Once there, she helped get aid to a few of the estimated 3.9 million displaced. “Your heart goes out to these people as they gather to accept relief from us. They give us blessings for the gifts,” she wrote. But she found herself disturbed every time she saw the bodies that were still in full view. “It is knowing there was life within them at some point,” she wrote. She saw a cemetery that was uprooted in Samar. People put the skulls and bones on grave markers so that dogs wouldn’t begin chewing them. The death toll could rise over 6,000. But even bigger is the number of the displaced. The aid is coming, and people are getting money from different foreign groups. Judy said that some people have received 500 pesos (about 12 dollars) to work in the clean-up. It gives them money to buy from the vendors in the marketplaces that have resumed. Some are selling looted goods, anything they can get their hands on. But Judy says the prices for everything are double what they were before the typhoon. Commodities, such as gas, are pricey. But gas is needed for transportation, generators, and electricity. She traveled the region and was surprised how Tacloban was hit so badly, but others, such as her mother’s town of Borongan, lost just eight people. It speaks to the lack of preparedness. And the lack of communication, which Rocamora referred to in the podcast. Some people thought this would just be a normal typhoon they would ride out. A surge? It should have been called a tsunami, to communicate the imminent danger. I asked Judy about the images that remained with her in her mind, that didn’t need a photograph. The girl was seven. What happened to her? Judy didn’t know. It’s what happens when you visit a disaster site. Everything is a loose thread. After two weeks, Judy’s coming home, back to her family and back to her job. The trip for her wasn’t cheap. A round-trip flight on short notice costs anywhere from $1,600 to $2,500. Wouldn’t it have been better just to donate the money? According to reports, President Benigno Aquino has said the government will need nearly $3 billion to rebuild these areas, while the United Nations yesterday launched a $791 million international aid appeal to finance the survivors’ needs over the next 12 months. Money is needed to change lives there. But simply seeing Tacloban was enough to make this a life-changing trip. Next to unimaginable hardship, the contrast is sharp. With or without the aid of photographs, the memories stay forever.